“Computer models of the heart incorporate detailed experimental information, both at the level of individual cells and at the level of anatomy. 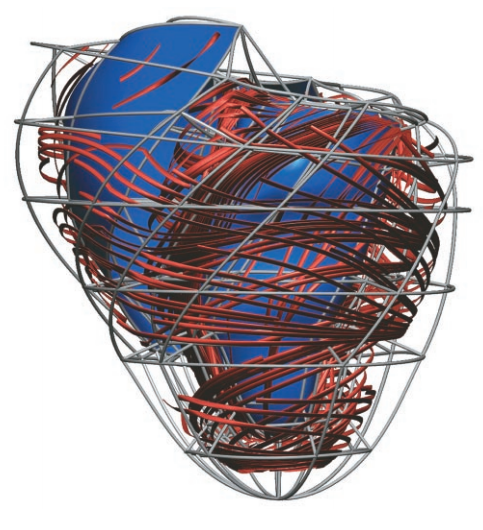 Here, a model developed by Peter Hunter’s team at the University of Auckland portrays the changing orientation of the heart’s muscle fibers from the outside to the inside of the heart wall. The spiraling of the fibers is believed to affect the flow of electric signals through the heart. Courtesy of Peter Hunter, PhD, Bioengineering Institute, The University of Auckland, New Zealand.”–Via. The following video accounts for how blood gets oxygen. Veins and arteries trace pathways; the heart is a pump that relays oxygenated blood to the rest of our bodies. While you observe this video, keep in mind that the heartbeat is regulated by electricity; it obeys a continuous rhythm that has never stopped. This entry was tagged Chapter 45: The Human Body Plan, Chapter 46.1: Circulatory and Respiratory Systems. Bookmark the permalink. When we studied this in class, I knew very little about the way the heart works; it amazed me that the heart has four different chambers and each one is sealed by a valve that regulates the blood-flow of each one, and it is all done unconsciously. Its impressive how the heart works and one thing I learned from this post is that the veins carry the blood into the heart and the arteries carry the blood out of the heart. The heart does an incredible job and keep humans and animals alive. This organ is responsible for pumping 5 liters of blood every single day of your life. The hardest working organ in the body. No why it is so muscular; it even works with electricity. Read Mary Shelley’s Frankenstein. Again. With new knowledge of the human body. It surprises me that the heart pumps blood through 60,00 miles of blood vessels that feed your organs and tissues. No wonder why if any of the arteries or veins is damaged we can suffer great risks on our health that can cause death. This is why it is so important to have a healthy heart and have a good diet. Also excercise can help with this issues. The heart is an extremely impressive organ. Not only is it important to understand how it works, but also how we can take care of our own, and how to identify symptoms of a heart attack. While men normally experience symptoms such as chest pains and shortness of breath, in many cases that pain is either not there or at least not the most prominent symptom in women. Women tend to experience unusual fatigue/dizziness, pain in the right arm, sweating, and nausea/vomiting. In order to keep a healthy heart, one ought to quit or don’t start smoking, maintain a healthy weight, and exercise 30-90 minutes daily. Also always be on the lookout for these symptoms, and alert your doctor if you notice any abnormality. A healthy heart is a happy heart, and it’s better to be paranoid than dead. Even though we haven’t yet study this in our class, I found this post very interesting and caught my attention because in the future it would be amazing for me to become a cardiologist. The heart has always been, as I say, ‘my favorite organ’ because of the impressive and important role it has in our bodies every single second of our lives. To me it is very impressive that the heart motion and the movement in our bodies are possible because of electricity. Our hearts are constantly pumping blood to the rest of our bodies through the arteries and without it, our lives wouldn’t be possible. The most important organ, the strongest organ in the human body, one of the most mysterious organs in the human body. All of this are references to the human heart. This post is really interesting because the heart has a unique way of operating and really organized. Since I was a little boy I always asked my unkle, a cardiovascular surgeon, that from where does the heart get the “spark” to start pumping litters of blood daily through the body. And he always answered me, that’s the beauty of the heart. And with that answer I’ve always been intrigued, will that be discovered one day or not? http://m.chabad.org/kabbalah/article_cdo/aid/380377/jewish/The-Heart-and-Its-Energy.htm this link leads you to a website that talks about cardio energetics. The most aske subject of the heart. I was studying for the test of the circulatory system using the book, but I did not get a visual representation of the heart. To get a visual representation of the heart, I searched the best place to find educational videos, YouTube. I came across the exact video posted about this article. This outstanding educational video really helped me understand how the heart pumps blood. It also showed how the sinoatrial node functions as the peacemaker of the heart, something I never underdstood. I am thankful for such instructional videos.